The most blasphemous of scholars would place the creation of the world not in the hands of the gods, but in the hands of nature herself. In such a creation myth it was not the elves or the dragons who came first, but the reptiles - the dinosaurs, the crocodiles, the lizards and the lizardfolk. Of course, such a myth has little basis in the truth of things, but it is an interesting postulation. 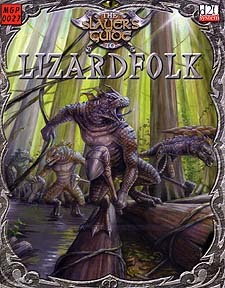 There is no doubt that the race of creatures known as lizardfolk, or lizardmen, is an ancient one indeed. Often overlooked because of their savagery and animalistic tendencies, the lizardfolk people are as much a part of the history of the world as men, dwarves and elves. As a reptilian race, lizardfolk prefer to live in the warmer parts of the world, in swamps and marches throughout such climates. They often build settlements of dome-like mud huts deep within swamps, hidden away and guarded against outsiders who would harm the tribe. Lizardfolk are unpredictable within their habitat - sometimes dealing peacefully with outsiders, sometimes attacking them ferociously. Adventurers travelling through swampland should be vigilant - their passing will almost certainly be known to the near invisible lizardfolk sentries but they may never realise that they were being watched. If provoked into a fight, lizardfolk are a very dangerous people indeed. Requires the use of the Dungeons & Dragons Player's Handbook. This product utilises updated material from the v.3.5 revision.